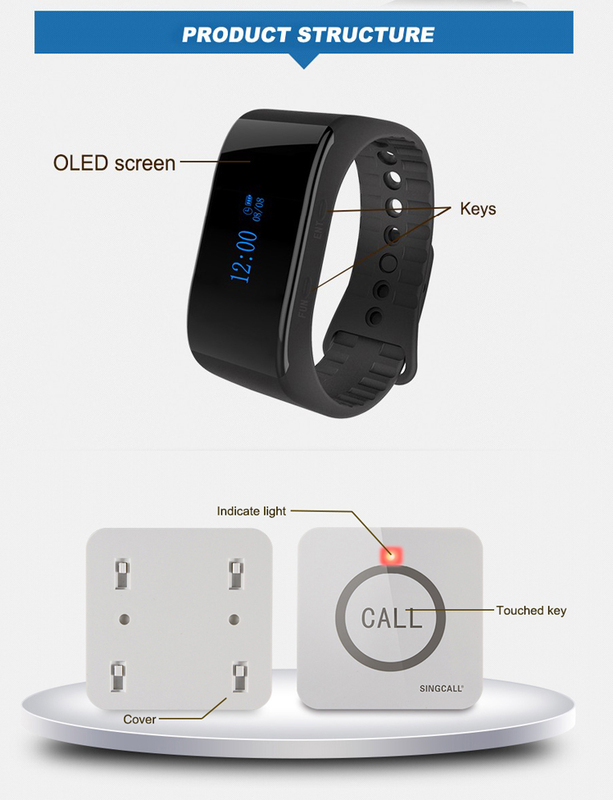 SINGCALL Touchable Button Waterproof Wireless Vibrating Wrist Watch Pager is widely used in the service area.It includes the button for guests to use and the signal receiver for waiters to use. When the guest is in need, he or she just presses the button near him or her, his or her desk number will be displayed with music or vibration. When a pager sends a wireless signal to the receiver, Wireless Calling System will alert the caregiver that assistance is required. 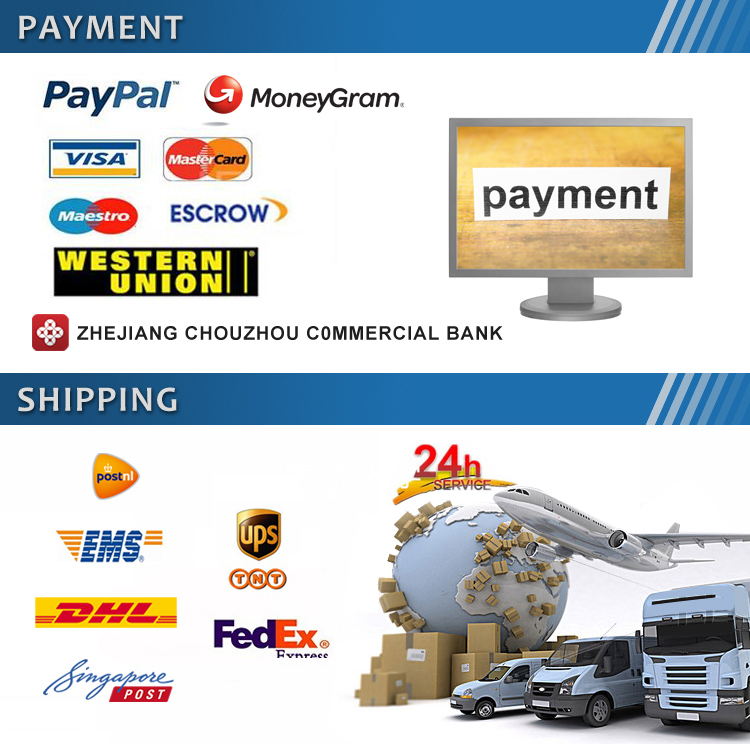 SINGCALL Wrist Watch Pager for Restaurant, Cafe, Fast Food Restaurant, Hotel, Golf Club, Bar, Night Club, Internet Cafe, Game Room, Karaoke, Hospital, Factory, Office, Anywhere needs attention of waiter. Have you ever been in a situation that you are ready to take your order in a restaurant but cannot find the waiter or waitress anywhere? 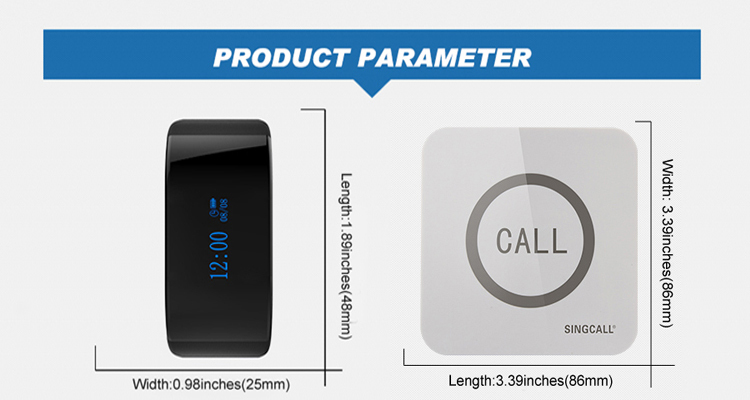 The SINGCALL Wrist Watch Pager for sale can solve your problem. 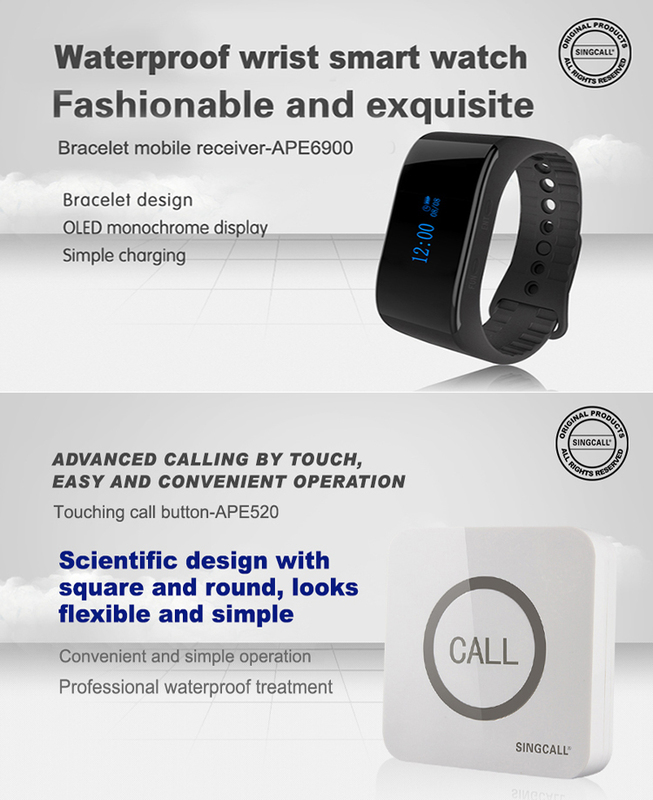 1.Wireless Calling System APE6900 is waterproof, and the waterproof grade is IPX7. 2.Wireless Calling System APE6900 has calendar, clock and alarm clock function. 3.With fast delete function, Wireless Calling System APE6900 can delete one registered number or all registered numbers with only one key. 4.Downloading the registration information through the serial port, makes the registration easier. 5.Wireless Calling System APE6900 can charge in order to avoid the problem of frequent battery replacement, super standby time (about 5 days). 6.With encryption function, avoiding the information lost by mistake operation. 1.Design with square and round, flexible and simple. 2.Calling by touch, easy and convenient. 3.360 degree water-proof, call at any time and place. 4.Simple pushing bottom shows the humanized design. 5. Designing with square and round, owning the simple and fashionable appearance. 6.86mm*86mm flexible square with big round button of 50mm diameter, letting simple enlarge fashion. 7.Super big touching button, make calling more convenient. 8.The super big attractive button with 50mm diameter, and the sensitive touching reaction , making the calling more convenient. 9.Full water-proof handling and simple pushing bottom base showing the humanized design. 10.360 degree water-proof handling and the simple pushing bottom base without screws showing the humanized design and making it simple to change batteries. 11.Simple registration, far transmitting distance. 12.Simple and stable login mode, the phenomenon of messy code does not appear. Signal is stable and long distance. 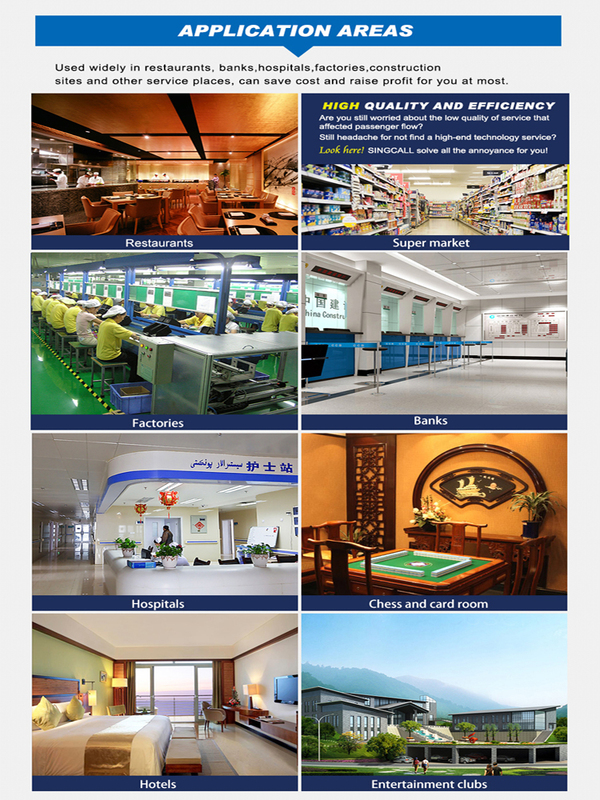 Cafes, supermarkets, tea house, coffee shop, drink shop, bar, restaurant, hotel, hospital, emergency center, clinic, nursing home, rehabilitation center, government departments, stadiums, industrial factory workshop, office, nightclub, KTV, disco, golf club, leisure clubs, billiard room, swimming hall, bowling alley. We have engaged in wireless calling system industry since 2003. Q1: How long is the effective range of the Wrist Watch Pager? A: The effective range is about 500m in an open area; the straight line distance is about 40-60m indoor with obstacle. And it won’t cause the wrong number; shorten the detection distance, as the time goes on. Q2: Do you accept the small order? For example we just buy one mobile receiver and one button? Q3: Can we put our logo or use our design on your products Wrist Watch Pager? A: Yes, we can customize your logo. But the quantities of the items have special requirements. 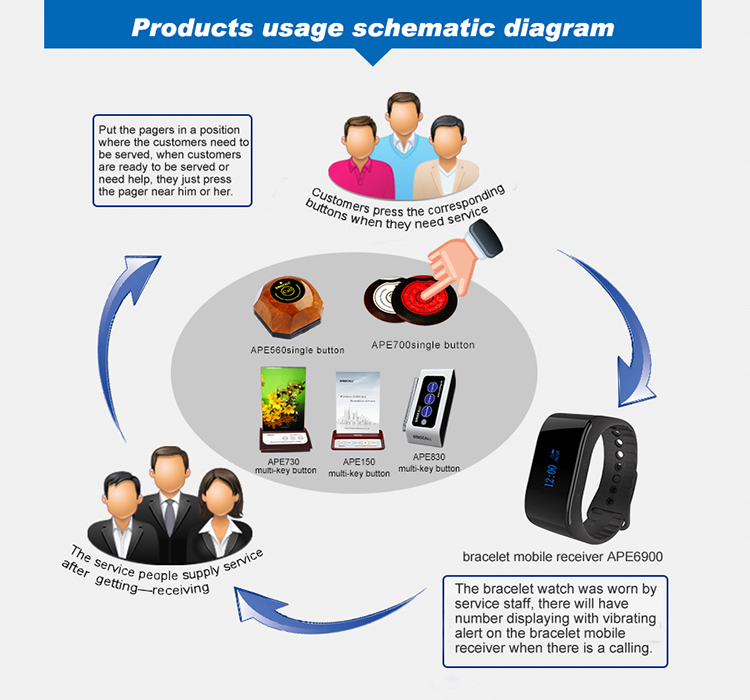 Q4: What certifications do SINGCALL products Wrist Watch Pager have? A: CE, FCC and RoHS. Q5: How long is the guarantee? 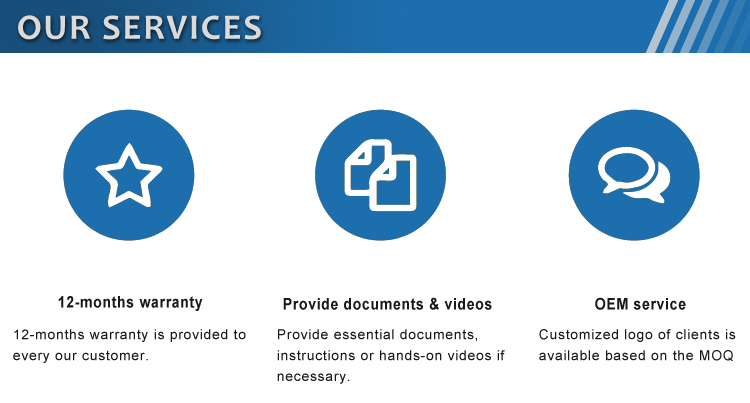 A: SINGCALL items enjoy one year warranty and maintenance for life. A: Normally, it is shipped with three days after payment received. Q7: How about if I do not know much about this item and could not install it, do you provide technical support? A: Yes, technical support is provided after sales. This item’s with full function but easy to operate, the only thing you need to do is to set it as our instructions manual. If you’re still confused, please leave us a message, we are willing to help you solve any questions.